Four months into the Cylon occupation of New Caprica, the human settlement is a bleak and paranoid place. President Baltar and a newly created human police force are mere tools of the all-powerful Cylon Occupation Authority. But the planet's oppressed residents cling to two frail hopes: that their resistance movement will weaken the Cylons, and that Admiral Adama and his fleet will return to rescue them all. Kara Thrace has been a prisoner of the Cylon named Leoben since the occupation began. He has confined her to an apartment and treated her with unusual civility. Although she resists him violently, he calmly downloads to a new body whenever she kills him. Her surreally domestic surroundings and his maddening immortality drive her to desperation. For his part, Leoben confidently believes that, with the help of his God, he can win over his prisoner's mind — and heart. Col. Tigh, by contrast, languishes in a barren cell until his wife, Ellen, secures his release by sleeping with the Cylon leader Cavil. Now missing an eye because of Cylon torture, Tigh swiftly reunites with the insurgency's leaders, Tyrol and Anders. Tyrol has obtained security plans for a police graduation ceremony, and a disillusioned police trainee, Duck, volunteers to blow himself up at the event. Horrified, Tyrol argues that this act crosses a moral line. Tigh, however, insists that it's just a military tactic, like sending a soldier out to die on a traditional battlefield. He approves the plan, and Duck begins preparations for his suicide mission. Far out in space, Admiral Adama presides over a diminished and dispirited fleet. His son, Lee, commander of the Pegasus and new husband of Lt. Dualla, resents his father's obsession with rigorous training for a rescue mission to New Caprica. Lee refuses to believe the mission can succeed; his father doesn't dare believe that it can't. At odds with his son, the Admiral's closest confidant has become the Cylon prisoner Sharon, who has slowly earned his respect and trust. - The episode synopsis (which I copy/pasted from BSG's official website) mentions Starbuck's name as Kara Thrace. But having been married to Samuel T. Anders, wouldn't her name be Kara Anders now? - This episode was nominated for an Emmy Award, Outstanding Writing for a Drama Series. - This episode was nominated for a Writers Guild of America Television Award. - A parental advisory was displayed prior to this episode airing on the Sci Fi channel. - This episode features revised opening sequence visuals. - This episode did not feature a teaser. - The survivor count is notably absent from the opening theme. - This episode and the next one were collectively awarded the IGN.com Editor's choice award and a quite favorable review in which they both scored a 10 out of 10 points. - Kat is now Galactica's CAG. - Helo is now Galactica's XO. - Dee is now Pegasus' XO. - Quoth Bear McCreary regarding the vocal piece at the beginning of Occupation: "After the Main Title, the first new piece of music is an original vocal piece. Ironically, this music is based on a song that I wrote for the Season 2 premiere that ultimately got thrown out. I later borrowed the lyrics from that first song and used them to create 'Lords of Kobol' for the episode 'Pegasus.' However, the original song remained unused, collecting dust on a shelf for 20 episodes, and now returns with a fresh orchestration, new lyrics and a haunting performance by Raya Yarbrough. The editors created this opening montage using the original version of this song, so this piece of music helped influence this scene from the very beginning." - The opening scene (which effectively begins after the credits) is quite moving. A soft lyrical song hums along in the foreground while fragments of events surrounding the lives of the New Capricans flash before us. - Cavil coming to meet Tigh. I love the quirky way in which he greets him, especially the bit with the sunglasses. The little psychological games he plays with Tigh are also marvelous to watch. Especially Cavil's comment about how the "bureaucracy must be served." The whole set of scenes are all quite subtle and most effective. - Tyrol and Anders blowing up a Cylon heavy raider. - Starbuck murdering Leoben. Leoben: "I'll see you soon, Kara." Starbuck: "Take your time." She then creepily goes back to her meal, ignoring (perhaps celebrating?) the blood on her hands. - Roslin: "It is simply not enough to kill Cylons because they don't die. They resurrect themselves and continue to walk among us. It is horrifying." - The scene where the Cavils frustratingly lecture the other Cylons in the midst of Baltar's apathetic presence about the ineffectiveness of their occupation. - Tigh describing how he lost his eye. - Tigh expressing his contempt for Baltar. I like how he always using his full name. - Leoben: "Hi, honey, I'm home... You kill me, I download, I come back, we start over. Five times now." I like how Kara tries to kill him again right after the speech he gives her. - Leoben: "To know the face of god is know madness." - Helo, regarding the repeated training missions: "Sixteen times now, sir." Adama: "The next one will be seventeen then won't it?" Helo: "Yes, sir." - Adama and Apollo arguing about the training missions. I love how pissed off Adama is. - Tyrol and Tigh debating whether or not to send Duck on a suicide mission. - Adama meeting with Boomer. - Dee to Lee: "You're a soldier who needs a war." - The raptor making contact with the ground. - Adama: "It's gonna be okay. It's really gonna be okay." While the resistance movement formed up pretty much as you'd expect it to, seeing just how far Tigh is willing to take it with the authorizing of suicide bombings is quite something to take in. 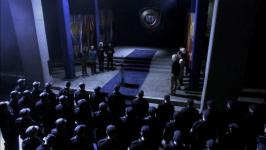 More interesting however are the stranger plot points on New Caprica. An obvious choice to discuss is the curious fixation Leoben has with Starbuck. They live together in a prison cell made out to be a domestic home. Leoben treats her like a trophy wife, going so far as to say things like "honey, I'm home!" and preparing meals for her. Starbuck's clearly being mentally damaged by the experience, but it's quite true to her character that she takes every opportunity she can to kill him. Again and again. As Roslin said, what a horrifyingly endless cycle. The Cylons and their plan get fleshed out quite a bit more in this episode. Cavil is fascinatingly immoral. Leoben is fascinatingly fundamentalist. Caprica Six and Galactica Boomer seem to be the other polar extreme, with their what seems to be hopeless idealism in thinking they can make things better with the humans. D'anna and Doral seem to be a bit more mellow with regards to where they stand. What does this all mean? It's not clear. But it's a lot more clear than the season 2 finale. What we can conclude is that the Cylons are deeply conflicted. Their unity is extremely important to them, but there are deep roots of division which have been apparently growing since the attack on the colonies. 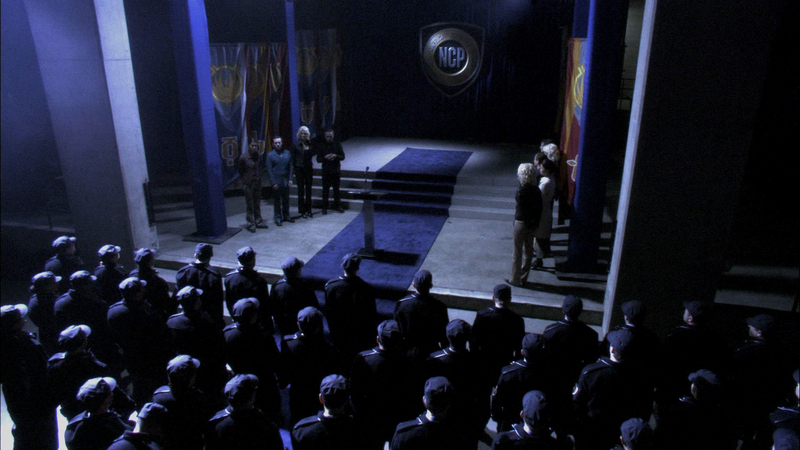 This may lead to a way for the population of New Caprica to be rescued, which brings us to the fleet. We saw far too little of the fleet in this episode I thought. The episode was aptly named Occupation of course, and focused mostly on the episode's namesake. But I felt the changes in the dynamics of the fleet were only barely touched upon here. We get only a vague picture of who's doing what on Galactica and an even less clear picture of how Apollo's been running his ship. We've seen very little of Commander Lee commanding his ship which I think is quite a shame. The relationship between Adama and Boomer is a bit harder to figure out. Their ever growing relationship has been hinted at since early in season 2, but understanding the psychology behind Adama's growing trust in her is difficult. I simply accept it at face value that he's a desperate man who resorts to desperate measures. Like Tigh and his resistance movement. Also worth mentioning is the music in this episode. While containing mostly a new score, I detected hints of what was originally the piece titled Martial Law from the season 2 episode Fragged. The lyrical piece in the opening scene is of course also spectacular. Once again, I salute Bear McCreary's subtle but impressive scoring and I already look forward to the season 3 soundtrack. As a final note, I must say while Occupation comes off as a particularly strong piece, the overwhelming number of plot threads is just that. Overwhelming. The episode I think knows its limited time constraints and keeps the overall picture fairly nonspecific for that reason, but all the stuff going on seems like a jumbled mess to me. Once again, the episode falls just short of answering the question of why the Cylons occupied New Caprica in the first place. We've got a pretty good idea, but most of the narrative is caught up in the events of the resistance, not examining the moral center of the Cylons. It was quite a fun jumble though and while the episode lacked a strong thematic center, it was emotionally captivating which set its enjoyment level a bit above the season 2 finale; nicely done. I enjoyed the both Occupation and Precipice. The only thing that somewhat bothers me is the obvious comparisons and parralels to Iraq. Yes, this occupation is similar just like any other occupation from an oppressing force, but other than that, it's apples and oranges. The US did not try to wipe out and committ mass genocide with the Iraqui people. The humans in this BSG are fighting for survival! I don't want to go on a political rant. I certainly don't agree wholeheartedly with US policy in Iraq now, but for the writers and producers to express their political views through their artistic medium seems audacious to me. As far as the show itself, it has brilliant writing and character developement. BSG is bold and ambitious. It's constantly challenging and changing it's characters. I applaud them for this. It's among the the top 5 shows going right now along with Lost, The Wire, Deadwood, 24, and Studio 60. One glaring problem with this otherwise perfect episode; in Lay Down Your Burdens pt. 2, Anders was sick from pneumonia, but in this episode he appears healthy. According to Cottle, he would've required medication to heal. So, how did he manage to recover without it? Well, I think what you list as a problem for this episode is not really one. Even in the present day and age, not all women take their husbands' names. It's a pretty antiquated and sexist notion, anyway. And given how progressive the show is, at least with respect to gender roles, I would have been surprised if Starbuck DID take Anders' name. (I know it's a minor point.) Btw, I really enjoy your site. Great job!